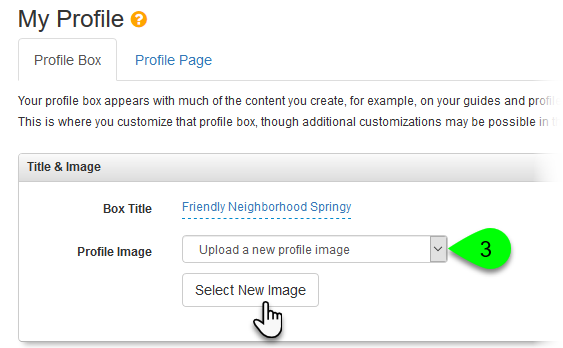 Under the Profile Box tab, select an option from the Profile Image dropdown. To keep using the currently uploaded image, select Display current profile image. To use the default placeholder image, select Do not display a profile image. To change your profile image, select Upload a new profile image and select the image you want to use. Really large images can greatly slow down page load times, so try to avoid full-sized or uncompressed images. For best results, we recommend using PNG or JPG images with a maximum width of 200px and maximum height of 140px.